It’s been WAY too long since our last video in my series. It’s taken longer than I thought to get back to editing the videos. Hopefully over the next few weeks I’ll get the rest of the video’s I already filmed edited and posted. It’s funny to see me pregnant again! And I was only about 28 weeks when I made these videos! 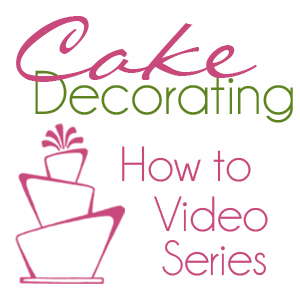 This video is about filing your cake, next week frosting. Here is the classic buttercream recipe that’s easy to use. Any buttercream recipe will work, just remember that for filling the cake with a dam (yes I say “dam” a lot in the video) and a filling, like my Chocolate Mousse, you want to start with THICK frosting. We’ll be thinning it down for covering the cake later. Mix shortening until smooth. Add flavoring and water, mix again until incorporated. Add sugar and salt, mix again until smooth. This makes 3 C thick icing. To make medium add 1 tsp for every C of icing. To make thin add 2 tsp to every C of THICK icing or just 1 tsp for every C of med icing. For Chocolate butter cream add ¼ C cocoa and about 1 Tbsp of water. just the frosting for the “dam” needs to be thick, once it’s stacked you use thin frosting for frosting!!! Thank you so much for your quick response…I really appreciate it. 2 last questions…for now 😉 … So, you really see a difference with your bake even strips, huh?? Are they Wilton brand? Thanks again…I’m amazed at all you do with 5 kiddos!! It depends on the recipe and where you live. In Houston, at sea level I only needed the bake even strips for one or two recipes, but here in UT up in the mountains I need it for EVERY cake and even then some still go concave on me. VERY frustrating. any brand works okay, in fact I know some people use an old dish rag they’ve cut into strips for that very purpose.